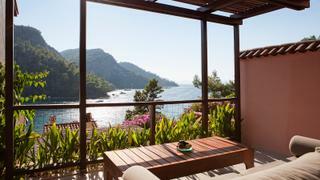 Hillside Beach Club can be found in a picturesque bay just south of Fethiye on the Turquoise Coast. 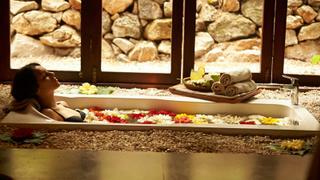 While children are being looked after at the kids club, parents can get some R&R at Hillside's Balinese spa. 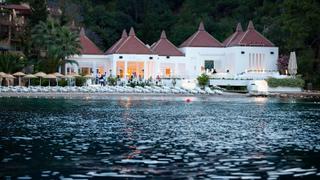 The beach-side Pasha restaurant serves Mediterranean cuisine. 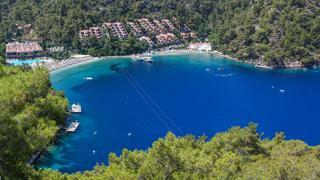 If you are planning to cruise with the family along Turkey’s Turquoise Coast (and you should - the Turkish Riviera enjoys a longer season than most of the Med, and has recently witnessed a string of hotel openings, from The Edition Bodrum to Six Senses Kaplankaya), make sure you drop anchor at Hillside Beach Club. Nestled on a picturesque bay just south of Fethiye, Hillside is just 25 minutes away from the ghost village of Kayaköy, and 40 minutes from Dalaman airport if you are flying in. With Instagram-worthy beaches, three restaurants and a full programme of activities ranging from arts and crafts to dance classes and watersports, it is sure to be a hit with all generations. Don’t miss floating cinema nights on the bay (during my stay, I catch a rather scenic screening of The Greatest Showman), and the one-night-only performance of the Ankara Chamber Orchestra that the resort hosts in August. Children will love the kids club, where they can get involved in chocolate-making workshops, photography courses or DJ masterclasses. There are separate programmes for different ages from baby to teens, so plenty of opportunity to get busy and make friends. This comes handy to accompanying parents, who also have the option to get involved themselves (waterskiing, catamaran sailing, hip-hop dancing, yoga or painting… whatever floats your boat) or take some time to relax in the resort’s two adults-only beaches. Keen swimmers will be pleased with the swimming lane that runs right across the bay, for uninterrupted laps. I spend my first day lounging on Serenity, a sleepy pebble beach hidden around the bay, which can be reached by boat (a 5-minute cruise, and boats leave regularly from the main jetty) or via a gentle, 20-minute scenic hike through the hills. The next morning I head straight to the adult-only silent beach, a heavenly spot with generous-sized sunbeds installed on floating platforms. From here, it’s just a short climb up the hills to reach Sanda Nature, Hillside’s Balinese spa. The silent beach is also an idyllic position to watch the sunset from - but if you prefer to enjoy your sundowners from deck, Hillside can organise sunset cruises to the islands in the bay of Fethiye or to Göcek, a bit further north along the coast (make sure you don’t forget your camera). Lunch is a rather lavish affair in the main restaurant, where seemingly endless buffet tables are lined with heaps of local dishes. Specialities include Sucuk (a type of spicy, fried beef sausage), Pastirma (heavily seasoned and cured beef tenderloin), Manti dumplings served with garlic, yoghurt and pepper sauce, stuffed aubergine Dolma, and Börek (filo pastry filled with feta and spinach). If swimwear season is a concern, virtually every salad under the sun is on display – from the humble caprese to imaginative combinations of betroot, pumpkin, coucous, courgette, pomegranate, radish... you name it. Or you can opt for freshly grilled fish, rotisserie chicken, and of course ­– local kebab. The dessert tables are not for the faint-hearted: you’ll need to exercise some serious self-restraint when facing baklavas, lokum, and a selection of patisserie worthy of a grand Viennese cafe. For a candlelit dinner by the water, book a table at either Beach (Italian) or Pasha (Mediterranean cuisine). The minimally decorated yet comfortable rooms are perched on the hill, beehive style. It’s a steep climb (there’s also a lift, but I decide to burn off the lunch calories), but it means the majority of rooms are afforded panoramic views of the bay. On the way up, you’ll come across more than one (conveniently marked) spot for taking the perfect holiday picture to share on your social media platform of choice. Catnip for millennials, you say? Yes, and we’ll be back. Drop anchor in the deep bay just off Hillside’s more secluded Serenity Beach, which is a five-minute tender to the main resort.